Ubisoft  has announced an exclusive partnership with NIVEA  for the Your Shape: Fitness Evolved  video game. The partnership brings together NIVEA, developers of the world’s best-selling body-care products, and Ubisoft, to offer a holistic, in-home program for consumers to sculpt their bodies leveraging Kinect™ for Xbox 360®. 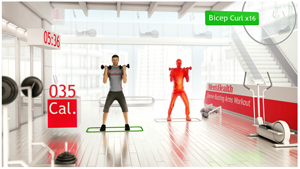 A NIVEA workout will be included in Ubisoft’s Your Shape: Fitness Evolved when the game launches in November 2010. Two other special workouts, developed in collaboration with NIVEA’s fitness and lifestyle expert Sarah Maxwell, will be available as downloadable content throughout 2011. Your Shape: Fitness Evolved will be the most innovative and complete fitness program available this autumn. Taking advantage of Microsoft’s Kinect, controller-free games and entertainment for Xbox 360 tracking capabilities and Ubisoft’s proprietary Player Projection technology, Your Shape: Fitness Evolved puts the player in the centre of the game, offering an immersive and rewarding fitness experience for men and women to stay in shape and reach their personal goals.